Many of today’s most popular applications and operating systems have been around for a long time. This is a look back at version 1.0 of some of the most popular and widespread applications of today, many of them ranging all the way back to the 1980s. To keep this article from becoming the size of a novel we were extremely picky with what we included. We only included applications that are in current use and so widespread and popular that they have more or less become iconic. We also decided to focus solely on Windows and Mac OS this time (sorry, Linux people, we’ll make amends in the future). 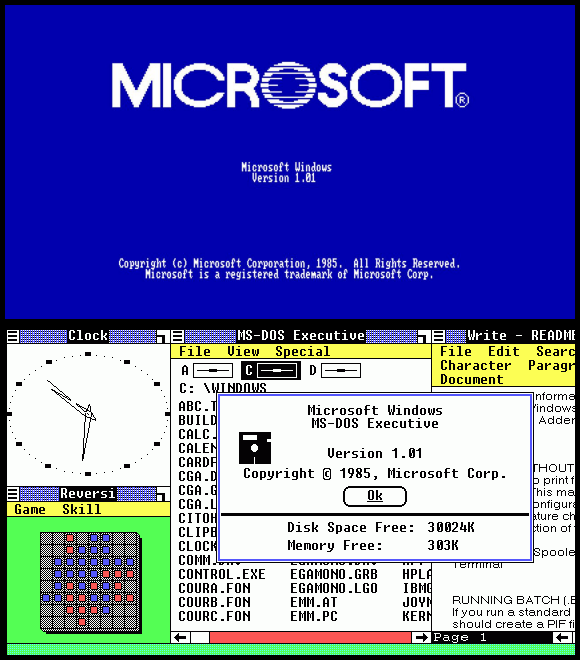 Microsoft Windows 1.0 was launched on November 20, 1985. To be precise, the first release version actually had the version number 1.01. The first version of Windows was only available on floppy disks and you had to install it on top of DOS; Windows 1.0 was essentially an MS-DOS program. Since Apple owned the right to have overlapping windows in the GUI, Windows 1.0 was stuck with using tiled windows (only dialog boxes could overlap windows). Top screenshot via Reddit. Bottom screenshot from Wikipedia. 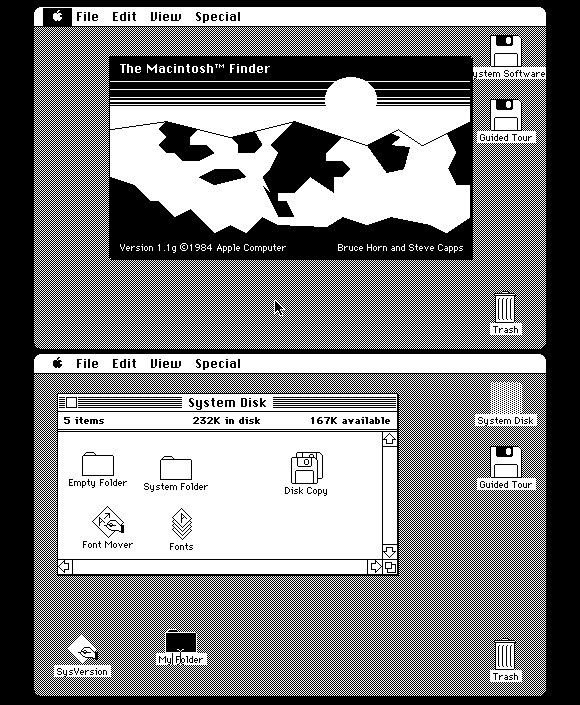 The first version of Mac OS came bundled with the first Macintosh personal computers that were introduced on January 24, 1984. At the time it wasn’t even known as Mac OS, but simply as the System Software. Apple didn’t officially rename it to Mac OS until the release of version 7.6 in 1997 (although the name had started appearing on the boot screen since System 7.5.1). Top screenshot by Nathan Lineback (ok, that one is from 1.1, but close enough). Bottom screenshot from Wikipedia. Developed by the brothers Thomas and John Knoll and licensed to Adobe in September 1988, Photoshop 1.0 was released exclusively for the Mac in 1990. 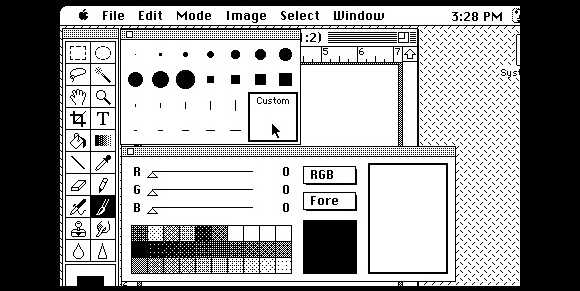 Thomas Knoll had started working on what eventually became Photoshop as early as 1987, initially as a tool for manipulating scanned images but it soon transformed into a full-fledged image editor. A Windows version of Photoshop was introduced in November 1992. From a great Photoshop 1.0 screenshot collection available at Creativebits. Microsoft Word was released for the IBM PC on October 25, 1983. Although it was a character-based DOS program (albeit with mouse support), Word was the first word processor that showed line breaks and typeface markups (bold, italic, etc) directly on screen while editing. 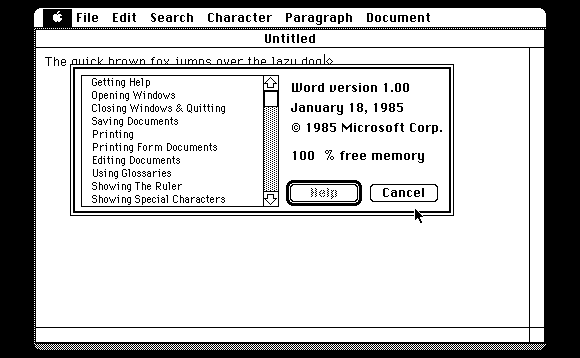 The first Word to run on a GUI was Word for Mac, which was released in 1985 (it’s the one in the picture). Word for Windows was released in 1989 with the release of Windows 3.0. An interesting side note is that MS Word was the first ever program to be distributed on disk with a magazine. A demo copy of Word was included with the November 1983 issue of PC World. Version 1.0 of Word for Mac. Screenshot by Nathan Lineback (and he’s got lots more). 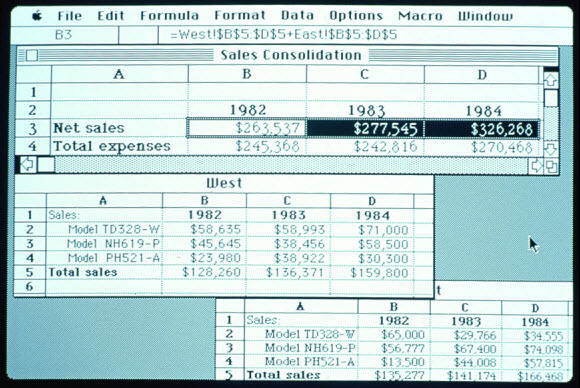 Microsoft Excel 1.0 was released for the Mac in 1985. It didn’t appear on Windows until 1987, after Windows 2.0 had been released. Excel was actually Microsoft’s second attempt at a spreadsheet program; it followed the relatively successful Multiplan, a spreadsheet program that was ported to a variety of systems such as MS-DOS, Apple II, Commodore 64 and more. 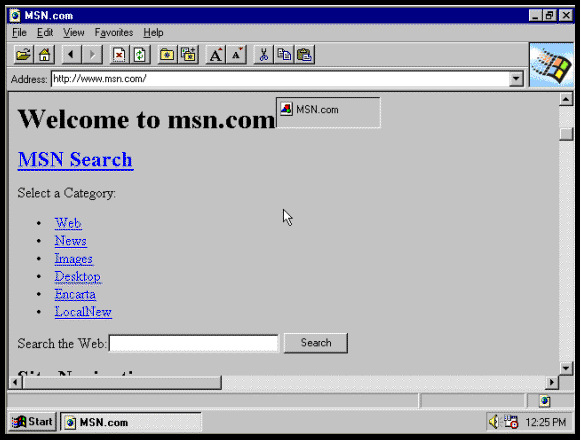 Internet Explorer 1.0 was released for Windows 95 on August 16, 1995. As most browsers of that time it was based on Mosaic, the web browser often credited with popularizing the WWW. IE was part of the Internet Jumpstart Kit in Microsoft Plus! (a pack of “OS-enhancing” applications) and was also included in the OEM release of Windows 95. Found at a Microsoft.com history page. Unfortunately we couldn’t find a prettier screenshot. Firefox is far younger than the other applications in this article, but we included it since it’s so popular today (and to balance out IE a bit). 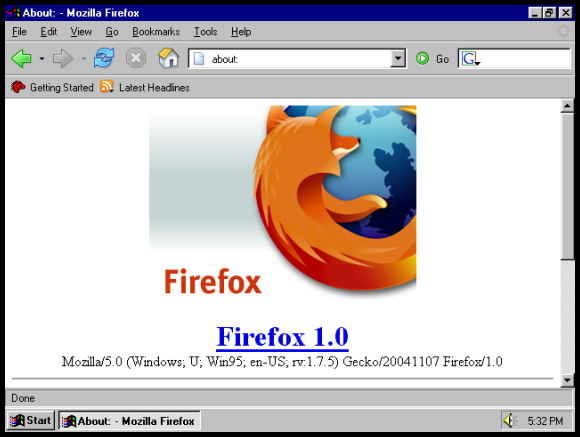 Mozilla released Firefox 1.0 on November 9, 2004, as the intended replacement for the increasingly bloated Mozilla Suite. It was far from obvious that the browser was going to be called Firefox. During its development the project was first called Phoenix, but had to be renamed due to trademark issues. The new name after that, Firebird, clashed with the Firebird database server project, so finally the name was changed to Firefox, and that one stuck. Screenshot by Andrew Turnbull. For a view of the development of the FF browser, check out his excellent collection of FF screenshots. Before we finish this article we’d like to give some credit to Xerox simply because a lot of the concepts for Mac OS, Windows, Word and other GUI-based applications were lifted from or inspired by work done at Xerox PARC (Palo Alto Research Center) in the 1970s. The Xerox Alto computer, never sold commercially but in popular use within PARC itself, was the first computer with both a mouse and a graphical user interface. It was operational in 1973, long before Mac OS and Windows made GUIs popular. It was revolutionary, but sadly the management at Xerox failed to realize the potential of the work done at PARC. Xerox finally made an attempt at commercializing this research with the Xerox Star computer in 1981 but due to a number of factors it never became a success, ultimately losing out to the Mac and PC. The image above is from the Digibarn Computer Museum. 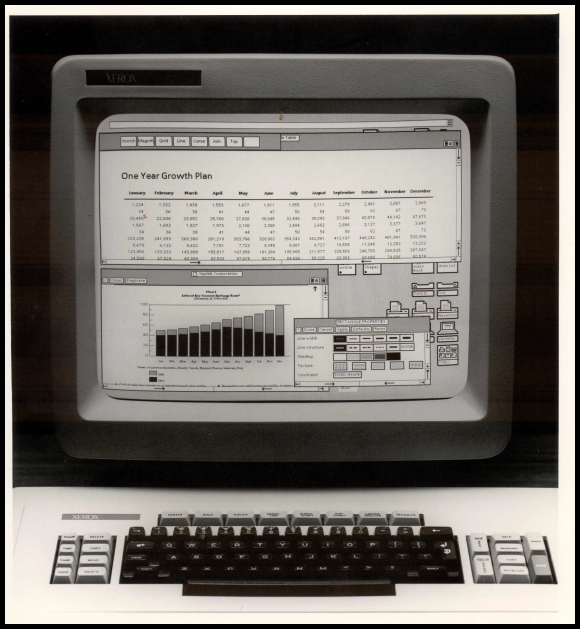 They have many more pictures of the Xerox Star that you can check out and compare with your desktop GUI of today. You’d expect more of a difference considering it’s been almost 30 years since then. It’s pretty safe to say that the researchers at Xerox have had a lasting effect on what our GUIs and GUI-based applications look like. Considering the thousands upon thousands of applications circulating out there, we hope you’ll forgive us for keeping the focus pretty narrow in this article by including only a tiny fraction of them. We hope you enjoyed this little piece of nostalgia. As usual, Wikipedia deserves a bit of extra credit for being a highly useful source of information. Wow, you did some great research! To answer the question: I’m 17 now, so I missed the most.. But it’s a great history-lesson! Wasn’t Windows 3.0 released in 1990 rather than 1989? Whoa the Xerox Star GUI was ahead of its time. Nice list. Sadly, I bet if you put Photoshop or Excel 1.0 in front of me today, I still would only use half of the features. Woa! The Xerox interface was indeed ahead of its time. That is quite impressive. You should make another entry like this but with old webpages if someone has kept screenshots. Those things can be quite interesting too. We all remember how searchengines looked in the mid nineties.